Top U.S. and Polish business and government leaders met last week at the New York Stock Exchange to discuss how to broaden the economic partnership between the two countries during the first-ever U.S.-Poland Economic Forum, organized by the U.S. and Polish governments and the U.S.-Poland Business Council. Miller Canfield principal Richard A. Walawender, director of the firm’s corporate and international practices and member of the U.S.-Poland Business Council, participated as a speaker and panelist at the Forum. Forum speakers included the Under Secretary of State at the Ministry of Foreign Affairs of the Republic of Poland; Commissioner for Financial Programming and Budget, European Commission; President of the Management Board and CEO of the Warsaw Stock Exchange; and Under Secretary of Commerce for International Trade, U.S. Department of Commerce. 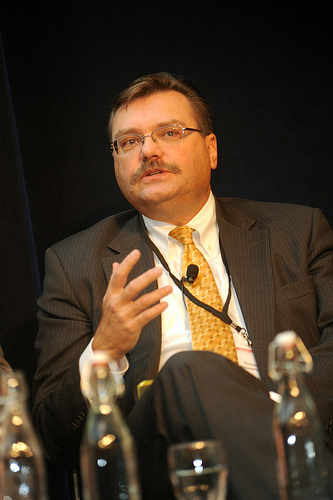 Walawender specifically discussed the challenges and opportunities for both U.S. and Polish companies in light of today’s global economic conditions. “Given the high debt levels in Poland and in Europe generally, governmental funding will not be available for important sectors such as infrastructure development, healthcare, environmental and gas development. However, this presents a great opportunity in Poland and Europe for private U.S. investment in these sectors,” he said. The U.S.-Poland Economic Forum is a follow-up to the U.S.-Poland Business Summit held in June in Poland, at which Walawender addressed the laws and issues confronting the new and expanding shale gas industry in Poland. The impending amendments could create a promising new market for U.S. service providers to the oil and gas industry, while helping Poland achieve energy independence. Walawender is based in Miller Canfield’s Detroit office, but spends much of his time working in and overseeing the corporate practice in the firm’s offices in NY, Chicago, Poland and Mexico. He has been the lead attorney on numerous multinational M&A transactions for U.S., Canadian, European, Asian, Mexican, and other non-U.S. clients. He co-founded the firm’s Polish offices in 1991.